The following article first appeared on January 9, 2010 for my The Humor of It…Through a Different Lens column for Shades of the Departed magazine. footnoteMaven has graciously allowed me to reprint my Humor of It articles here on What’s Past is Prologue.While these were my “top ten photo resolutions for 2010”, they can apply to 2011, too. Besides, who keeps the resolutions they make? We can merely recycle them from year to year! Beginning a new year is a time for reflection when most people think back on the previous year and try to challenge themselves to improve various faults and foibles. Of course, before beginning a new year we have to end the previous one, and that’s usually a time for partying. Therefore, most of our resolutions to change ourselves may have been half-heartedly assembled in the throes of a party-induced hangover, which is why these great ideas tend to fizzle out quicker than a cheap sparkler. So take your time before making resolutions – think about it! To help you out, I’ve decided to come up with my top 10 resolutions specifically for Shades of the Departed readers, so they are all related to photographs. But they are also written by me, the resident humor columnist, so…let’s just say you might want to think about these as well before making any final resolutions! 10 – If you are photographing a group of children, add a “silly face” photo in the session. It will keep them interested, less cranky, and may even make them smile for more photos. Plus, they’ll be laughing at the silly photo for years to come. That is, until they reach the age when they begin dating and you share it with their prospective paramour…then it’s not so funny. 8 – Pay attention to the background in your photos – or even the foreground – so your shot doesn’t have any distractions from the main subject. 7 – Remember to “strike a pose” for a memorable shot! 6 – Be creative and have fun with your photography! Consider creating optical illusions with some forced perspective shots to liven up your vacation album. 5 – Remember that pets are people, too. They really don’t enjoy dressing up in costumes any more than people do – except they are less vocal about it. Come to think of it – your babies are people, too. They will show their displeasure by their expressions, but remember that they will get vocal about it once they’re old enough to talk! 3 – Since you are always the one taking photos, make sure you get some of yourself. Only ask someone else to take it – unless you have very long arms or a timer on your camera, most self-portraits are not very flattering. 2 – Keep shoes in shoeboxes, not your photographs. Get them out of the boxes – and off of your hard drives – and into frames or albums to display around your home or office. Don’t be too busy taking photos to remember the joy in looking at them and remembering the fun. 1 – Forget mug shots – mug your relatives for copies of family photos! Are you, like me, tired of waiting for family members to dig out those precious photographs you’ve heard so much about but have never seen? It’s time to take matters into your own hands. I resolve to sit on doorsteps until they find the photos and reveal them to me. I have a feeling some of my cousins may be entering the Relative Protection Program, a distant cousin of the Witness Protection Program, that seeks to protect the innocent from a hungry photograph-hound like myself. But hey, I’m a genealogist, so I ought to be able to track them down! All photographs from the collection of the author except as noted. The following article first appeared on December 8, 2009 for my The Humor of It…Through a Different Lens column for Shades of the Departed magazine. footnoteMaven has graciously allowed me to reprint my Humor of It articles here on What’s Past is Prologue. Ah, Christmas…it’s the most wonderful time of the year! Or is it? For some children, it’s the time of year to be scared to death. First, there’s the whole threat of “being good” or else! The mere thought of not getting any presents is certainly scary, but there is something about Christmas that isn’t all happy and jolly. In fact, it instills more fear in young children than a Halloween haunted house – it’s Santa’s Little Workshop of Horrors and the annual photo with Santa! Santa has a reputation of being a happy and fun kind of guy. After all, he brings you toys for no apparent reason. That’s a guy any child would love, right? Then why is that big fat guy with a bushy beard so absolutely terrifying for so many children? It’s the terror that makes the annual “photo with Santa” such a delight for adults. Parents, determined to get that holiday photo no matter what, gratefully accept the photo even if the child has an expression of fear and terror and tears flowing like a river. Years later these photos are funny, but one can only imagine that it wasn’t that funny at the time for all involved – the scared child, the parent who has to calm them, and poor Santa who has to withstand the screams. I hope the malls provide ear protection with the red suit. 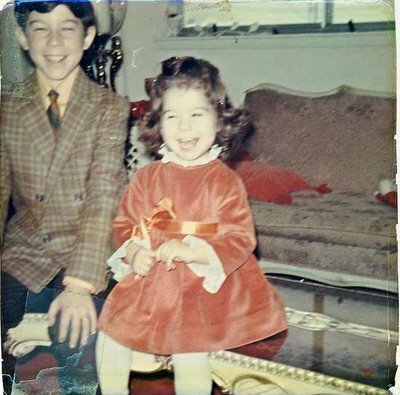 But, by now Grandmom knew the tricks to a happy photo – candy canes for all! Or maybe it was Santa himself who learned this trick over the years – if the kids have something to put in their mouth like a pacifier, they aren’t nearly as loud. By the time we reach adulthood, we really seem to forget how to think like a child. This may be why the child’s fear of Santa comes as such a surprise to the parents. If you’re a parent who will be taking a little one for the annual Santa photo, let me remind you of a few things. First, no matter how happy or friendly Santa actually looks with that whole jolly persona and twinkle in his eye, there is something menacing about him. Think about it…he sees you when you’re sleeping? He knows when you’re awake? That’s a bit stalkerish, don’t you think? For years we tell our children not to talk to strangers, but there’s this apparently omnipotent dude that you see once a year and have to be nice and smile for the camera. Mark my words – children pick up on this incongruity! It must be quite a challenge to be a photographer for Santa. Even if you manage to get a nice, happy expression on the faces of the children, there’s always the distinct possibility that Santa himself may screw up your holiday photo. After all, which is the worse or the two? Being the frightened child who has to sit on Santa’s lap, or being Santa? Santa, who, hour after hour and day after day, has lines and lines of children who want to see you. Well, most of them want to see you…but then there are the few, the screaming, the scared. It must be far worse to be Santa with a headache from all the high decibel screams than it is to be the crying child. The children get over it with age and perhaps some therapy, but Santa has to put up with hundreds of screaming children every December. Even if Santa doesn’t get a screamer, there’s the endless litany of “gimme” requests that’s enough to drive a teetotaller to the bottle of Jamison’s. Every household seems to have at least one photo of Santa who looks as though he’s had a few. But, who can blame him after all? What’s the secret to a good photo with Santa? Maybe if Santa were closer in age and size, he wouldn’t be scary at all but cute and cuddly! If you want to see more photos of children who are scared of Santa, visit the Chicago Tribune “Scared of Santa” photo gallery. The following article first appeared on June 27, 2009 for my The Humor of It…Through a Different Lens column for Shades of the Departed. footnoteMaven has graciously allowed me to reprint my Humor of It articles here on What’s Past is Prologue. I’m currently on hiatus writing this column for Shades, but I encourage you to visit the latest edition of the digital magazine (The Mourning Issue) for some excellent writing and photography! When it comes to summer vacations, it helps to maintain a sense of humor. The same can certainly be said for vacation photos. On vacations in the pre-digital camera age, photographers were limited by the amount of money they had for film and developing. This resulted in a certain stinginess when it came to taking photos. If that one photo you took in front of Mt. Fuji was fuzzy, that was your only shot. Which explains why a lot of out-of-focus photos exist in my parents’ collection of photos. Or the family went away for an entire summer and you have three photos to show for it. Today, we don’t have that problem, but the opposite…a glorious glut of photographs. It’s free, take another! We don’t have to print them all! After the vacation photo-taking blitzkrieg ends, you can be left with hundreds of photos from your two weeks away. If you have had to suffer, or rather ENDURE, with either a computer-generated slide-show or a phone-book size photo album of Aunt Suzie’s trip to the Blarney Stone, raise your hand! Better yet, if you are the one making your family suffer, raise BOTH hands! Okay, I admit it – sometimes I take too many vacation photos, and quantity does not always mean quality. Over the years I have discovered that those textbook perfect landscapes of famous sights throughout the world are great if you want to make prints to frame and display. But if you really want to remember the FUN in vacation, find the humor of it! Everyone remembers to get a shot of the Eifel Tower, but do you have a photo to capture that moment when the rain nearly drowned your family, or the waiter dropped your lunch, or your teenager nearly feel asleep while standing up on your twelfth museum visit of the day? I’ve seen several articles recently both online and in print all on the topic of summer vacation photos – how to take better photos, how to frame your shots, and other great suggestions. Here are a few non-serious tips on putting the humor back into your vacation photos. 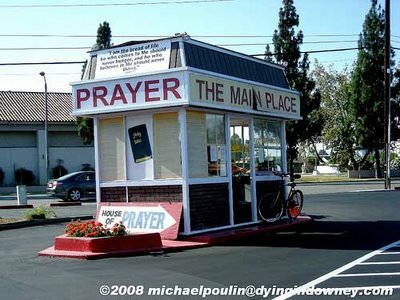 Road Trips – If you’re cruising the highways this summer, be on the lookout for interesting signs. Acadia National Park, Maine, 2001 – Hmm, what do they mean by that? 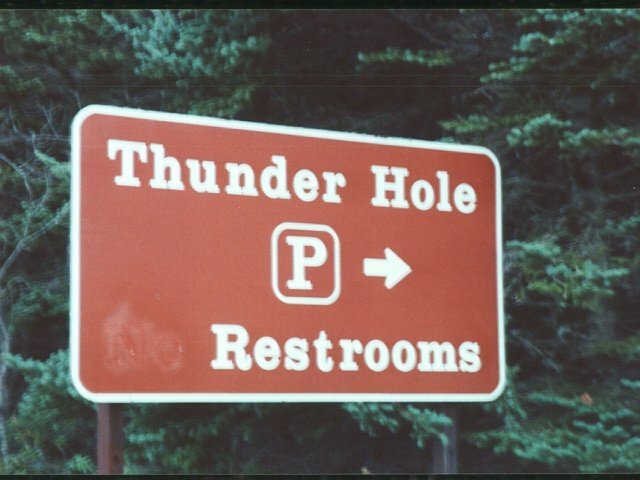 I think I’ll look for another restroom. Or maybe they only seem interesting because you can’t understand them. Croatia, 2008 – At least this town has some vowels. Cultural Outings – If city tours with lots of architectural and cultural sights are on your schedule, don’t forget to liven things up a little when too many museums have you feeling tired. Kalwaria Zebrzydowska, Poland, 2001 – Even pilgrimages have their lighter moments! Nature – Visits to national and state parks are always fun in the summer! Don’t forget to take some photos of people in addition to the beautiful vistas. Rocky Mountain National Park, Colorado, 1995 – It’s a rocky mountain indeed, but all that hiking makes you stronger! Traveling with Children – With children in tow, it’s inevitable that boredom will strike – just as you’re about to take a photo. Don’t let a surly face spoil your fun times – encourage the kids to strike a pose instead! Mystic, CT, 2000 – Strike a pose! Mystic, CT, 2000 – A striking resemblance! Remember, kids, capture the moment you’ll want to remember. For every place I’ve been, I can marvel at the history or beauty with the “usual” photos. But when I want to remember the fun I had, I pull out the Other Photo Album and have a good laugh. The following article first appeared on May 30, 2009 for my The Humor of It…Through a Different Lens column for Shades of the Departed. Of course, the subject was “in season” at the time, but I’ve decided to re-print my columns in the order they were published. footnoteMaven has graciously allowed me to reprint my Humor of It articles here on What’s Past is Prologue. I’m currently on hiatus writing this column for Shades, but I encourage you to visit the latest edition of the digital magazine for some excellent writing and photography! As May leads into June and the sweet promise of summer, I am reminded of two spring and summer “rites of passage” of my youth that were also big photographic events: proms and graduations. Both events require you to wear somewhat “unnatural” clothing – that is, outfits you will never again wear in public. Because of these outfits, the photos of these events are often seen as humorous many years later. My brother parodies the classic prom pose in 1985. The unnaturalness of a prom is the fact that you dress up in wedding-like costumes of tuxes and gowns, yet you are warned by every adult in your life to refrain from all things lewd, dishonorable, romantic, and/or fun. In other words, you dress like you’re getting married but can’t do anything that would be associated with an actual marriage event. 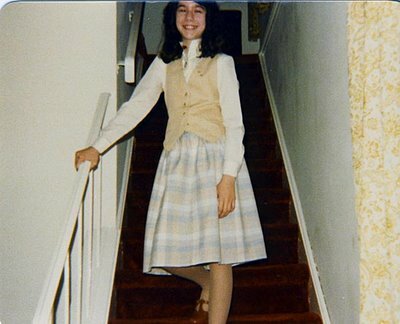 Nearly everyone who attended a prom has the obligatory photos taken at either your house or your date’s house or both. Often there is a shot of several couples who have decided to drive together, usually because only one lucky person had the license and the car. In these group shots, the couples look uncomfortable and anxious to go have some fun. Of course, they also look blinded by flashbulbs in what was likely the thirty-second photograph taken of them before even leaving the house. My face is frozen into a smile…can we leave now? Once at the prom, couples lined up for their “official” prom portrait. These are often the most humorous because you are put into the official Prom Shot position, an unnatural pose that you and your date will never find yourselves in unless you are standing way too close together while you wait in a buffet line. Does anything say “1977” quite like a white tuxedo? The best thing about these photos is that they seem to become dated almost immediately. They “depreciate” faster than driving a new car off of the lot. Looking back at the “old” hairdos and fashions is a scream, especially if your children or nieces and nephews find your ancient photos. In my junior and senior prom photos, I appear to have lived during the Victorian age since I am wearing decidedly un-cool dresses that barely showed my neck much less anything lower. What’s funny is not the fact that my mother chose these dresses for me, but the irony of it. I was not in need of any protection from the wandering hands or eyes of my dates – both were good friends who had already decided to enter the seminary after high school. My prom dates became Catholic priests! Well, at least I didn’t tempt them in those outfits! When it comes to uncomfortable poses, nothing beats a good graduation photograph. 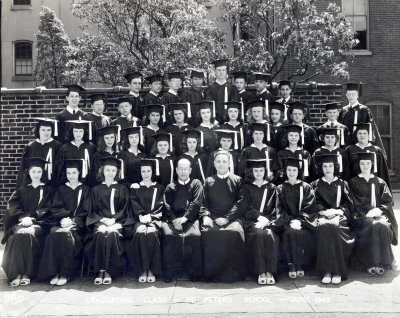 The classic portrait of the graduate wearing a judge-like gown and a “mortarboard” cap has not changed much over the years. In fact, you might even have a hard time dating a graduation photograph if it weren’t for hairstyles changing over the years, or perhaps styles of eyeglasses. The trick with these portraits is the ability to balance the board on your head – without messing up the “do” – and look natural in the process. Father and son graduate high school 25 years apart. It somehow seemed easier for the boys to look more natural than the girls wearing the silly hat, perhaps because they were far less concerned about their hair. For my portrait, the photographer chose a very large cap and used a clothespin in the back to hold it in place. As with any portrait, the photographer then turns your head in an odd angle and your torso in another. The fact that it was portrait day was stressful enough! “How’s my hair?” “How’s my face?” “OMG is that a zit? !” It doesn’t really matter how you look – later generations will laugh at your photo anyway. Graduating Class of St. Peter’s Grade School, Philadelphia, PA, 1948. Next week I’ll watch my oldest niece attend her first big “dance” – not quite a prom since dates, gowns, and tuxes are not required. Two weeks later, I’ll watch her don the funny hat and graduate from 8th grade. As the proud aunt, I’ll take a lot of photos. They will all be quite serious. But I’ll have to remind her that she’ll see the humor it them years later – when she is old enough that she thinks she looks like a baby in those photos! Happy dancing and graduating to all, and remember to smile for the camera! The following article first appeared on April 25, 2009 for my The Humor of It…Through a Different Lens column for Shades of the Departed. footnoteMaven has graciously allowed me to reprint my Humor of It articles here on What’s Past is Prologue. I’m currently on hiatus writing this column for Shades, but I encourage you to visit the latest edition of the digital magazine for some excellent writing and photography! My brother is “bunnied” by his daughter, December 2006. To big children, it’s still hysterical! My friend Joe and I are victimized in Rocky Mountain National Park by our German friends Peter and Franz, September 1995. I took this poorly framed photo of my “adopted” aunt and uncle on the dance floor at my brother’s wedding in 1993, but at the time I didn’t realize my mother, sheepishly grinning on the far left, was a Bunny Ear Giver. At least we know where my niece gets it from. Mom gives Lillian some bunny ears, November 1993. Not even celebrities are immune to the curse of the Suddenly Appearing Bunny Ears! But Bunny Ear Givers are not the only offenders among those who seek to destroy your group photograph. There are also the Leaners. A Leaner likes to be on the far edge of a group photo. Then they wait patiently until just that right moment between “1, 2…” and “Cheese!” when they suddenly and aggressively shove themselves towards the center of the group. This naturally causes a domino effect among the other group members, and much hilarity to all but the photographer and the person at the bottom of the pile. My brother’s hockey team gets Leaned on, circa 1976. Sometimes Leaners are somewhat less hostile and become a Look At Me! A Look At Me! takes more initiative and doesn’t wait for that exact moment. They simply get in between the group and the photographer in the most obtrusive manner possible. As you can see, my family suffers from various forms of these illnesses. My brother gets in the way, November 2007. Here’s another Look At Me! The group knew the charger in the photo, and if the photographer hadn’t snapped the shutter at this exact moment, he’d have captured a Leaner event instead as Look At Me rushed towards us at extreme speed. Mt. Vesuvius hasn’t erupted in a while, but a Look At Me was let loose at Pompeii, April 2006. My final category to illustrate how there’s always One person seeking to spoil your group photo consists of the Funny Faces. I’m not trying to be offensive to unattractive people – I mean those who purposely make funny faces just to ruin your shot. To illustrate this category, I present the genetic carrier of the DNA in my family that causes these photo disturbances. I have very few photographs of my maternal grandmother. In the ones I do have, she is a very attractive woman in her younger years. But there are few, if any, of her as an older woman. She always said she didn’t like to have her photo taken, but I have finally uncovered the truth. After seeing this picture, I think she was banned from group photographs by her family. Yes, folks, that’s my grandma! I guess it really does run in the family. I’m the Bunny Ear Giver, but there’s also a Leaner and more than one Funny Face in this group! March 1991. The next time your family gathers together for a tender photo moment, ponder your choices. You can either be good, sit up straight, and smile. Or, you can be One of Them. You, too, can be a Bunny Ear Giver, a Leaner, a Look At Me, or a Funny Face. Or, if you have friends and family like mine, just have everyone unleash their inner child AT THE SAME TIME. The Pointkouski Family, who will now formally disown me November, 2007. Childish? Of course. But the result is priceless. And a little embarrassing. But after this, we actually got some nice, normal family photos since it was all out of our system! If you are the photographer in your family, just remember there’s always One. Or Many! The following article first appeared on March 28, 2009, as my debut appearance writing The Humor of It…Through a Different Lens column for Shades of the Departed. footnoteMaven has graciously allowed me to reprint my Humor of It articles here on What’s Past is Prologue. I’m currently on hiatus writing this column for Shades, but I encourage you to visit the latest edition of the digital magazine for some excellent writing and photography! This is a family portrait of all four of us taken by my grandmother. The ear is my father. My brother didn’t make it at all except for the tiny hand on my shoulder. But that’s a lovely sofa, isn’t it? Dad took this shot…we’re all almost in it! Okay, Dad, I’m ready for my close-up! Even at not-quite-two-years-old, I was a child prodigy. You see, I had already learned the secret of how to get into a family photo – sit on the left. If you weren’t on the left, you didn’t get in! By now, my brother has caught on. He’s slowly sliding me over on the coffee table. If he had slouched a little, he might have made it. This photo had the borders cut off for some unknown reason, but it’s clear by our smiles that we’re elated – we just knew that by the thirtieth picture we’d both make it in the shot! Well, almost make it into the shot – my brother’s just a tad bit too tall to make it. 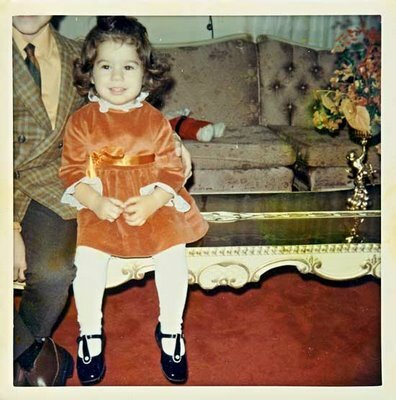 What’s funnier about these photos – the pictures themselves or the fact that my family actually saved them all these years? What exactly was the thought process here? “Well, it’s not too bad…look, you can see this is him by his left ear…” For families in the pre-digital age, even a bad photo became the sole remnant of a memorable event. 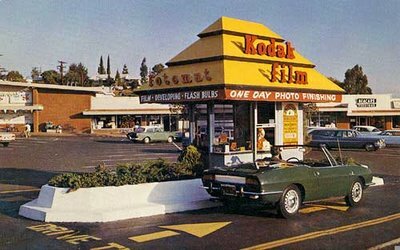 Cameras, film, and developing were expensive! And you never saw the result until the whole roll of film was used up, taken to get developed, and picked up. 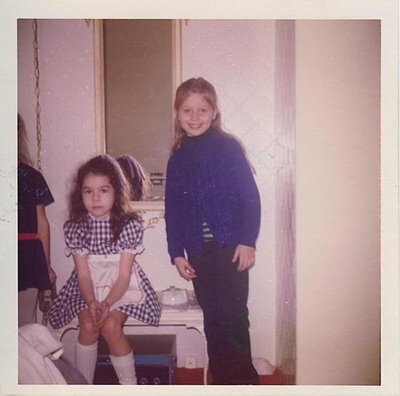 So, at least in my family, these “bad” photos became as valuable as “good” ones because they were the only ones. 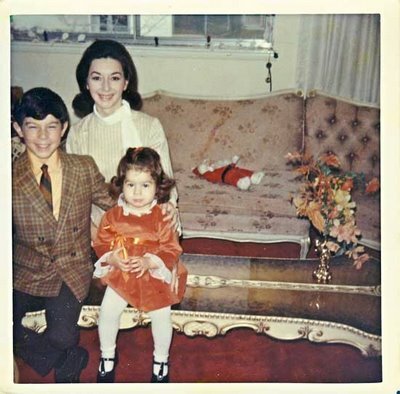 My mother quickly became dissatisfied with the results of her unique photographic talent for taking photos of her beheaded children. She simply gave up. I don’t think I ever saw her take another photo. “I can’t take pictures” became her personal mantra. Thereafter, Dad became the official family photographer. It was probably a good thing, too, because without mirrors in the home I would have grown up believing that I was missing an ear. Mom was always blamed for the missing body parts, but Dad was an occasional culprit, too. Just because Dad was taking the photos, we still weren’t immune from having our heads cut off. It just happened less frequently than back when Mom was taking the photos. This was my sixth birthday party. My guests were my friends and neighbors, the Ferguson girls. Unfortunately, Shona wasn’t as smart as her older sister, or she had yet to catch on to our family secret – stay to the left! It’s ten years later and I’m now sixteen. 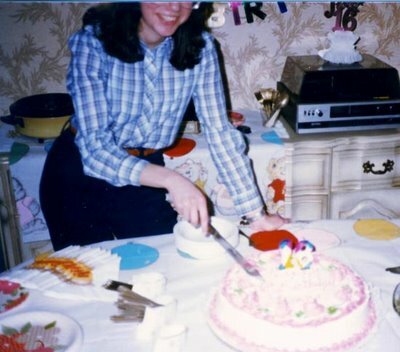 I’m perfectly centered, but the view of the cake took precedence over my head. I was used to it, though. This was me several years earlier. I was tall for my age, but not that tall! Can you notice the family resemblance between my and my half-headed brother from the earlier shots? 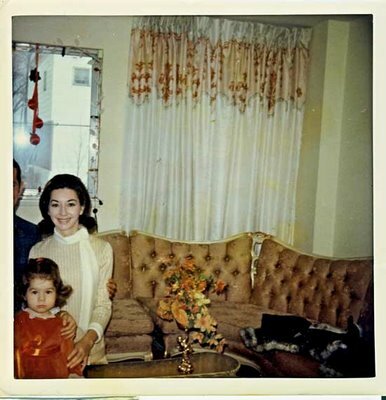 It took many years for me to discover that my family was not unique in this extreme photographic ability. In fact, there is even a name for it! What you see in the above photos is called parallax error. Now, to me that sounds like Star Trek plot number seven in which a transporter accident lands the crew in a parallel universe. But it really means that what you see isn’t always what you get because the viewfinder wasn’t necessarily connected to the lens. Older cameras, especially the inexpensive 126, 110, or point-and-shoot 35mm’s that my family used, had a viewfinder that was separate from the camera’s lens. So what appears to be “framed” in the viewfinder isn’t really framed at all by the camera lens itself, and it isn’t what the lens captures. See, Mom, it’s not your fault after all! It really was the camera! 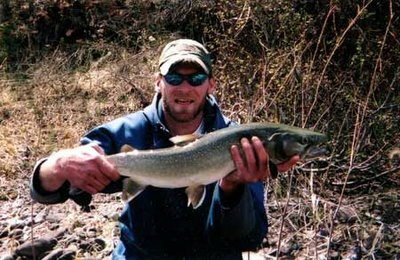 Here’s another example from the never-before-published photo collection from a well-known genea-blogger who shall remain nameless to protect my new job as a columnist here at Shades. This is an attempt to capture MavenSon’s great catch. But wait – is that really him? Nowadays, you rarely see the beheaded shots anymore. It’s a shame really, because they can be quite amusing. Today, most cameras have a single lens reflex that eliminates the parallax problem because what you see really is what you get. Many digital cameras don’t even have a viewfinder at all and instead use a screen to show you what the lens ‘sees’. When my mother first saw the 3 inch screen on my tiny digital camera, she exclaimed, “Wow – even I can take a picture with that!” And it’s true – my 3-year-old niece is able to take a well-focused, well-balanced photograph (obviously a child prodigy like her aunt). The only time her brother is missing a limb is when she tries to do that the old-fashioned way – by jumping on him to beat him up. In the modern digital age, it’s time to say good-bye to our beheaded family photos. But, of course, there’s still a chance your family might see one. 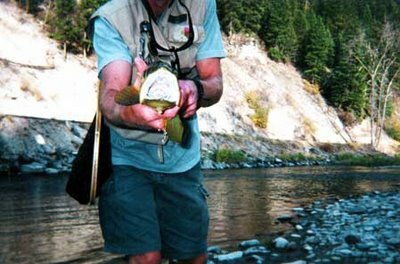 For even without viewfinder errors, there are still simply bad photographers. Here’s hoping we’ll see you in your next family photo session! It’s a Blog, It’s a Magazine, It’s…Brilliant! Stuffed in a photo booth with our shades on, 1986. Once a month I invite you to read my Weekend with Shades column, The Humor of It, over at one of my favorite blogs, Shades of the Departed. Well, this month is special because the lovely and talented footnoteMaven has done what few in the blogosphere do…she has created something new, creative, and different. Rather than publish the columns every weekend on the blog, she has taken a month’s worth of great articles and created an online magazine! Please visit Shades of the Departed – The Magazine for the link and viewing instructions. It is original, creative, and simply stunning to view. Yes, I am one of her columnists, but that is not why I am praising it – I feel lucky to be among the writers she features on her blog, and I hope what I give her is “good enough” for such a brilliant idea! So, be warned, this new magazine is so brilliant, you might just have to put some shades on! And if you’re interested, my article about The Photo Booth begins on page 54! Weekend with Shades: If You Don’t Have a Photo, Choose One! I’d choose the nice Polish fellow sporting shades pictured here to be my ancestor, but if he was my ancestor he wouldn’t have been pope! July – Fotomat: What’s That? It’s time for my monthly Weekend with Shades column at Shades of the Departed, The Humor of It. This month read all about a developing genealogist…me! 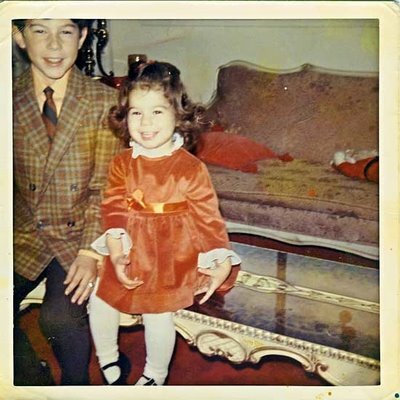 I didn’t realize it back then, but working behind a photo developing counter in college taught me skills that later became useful as a genealogist. It wasn’t funny at the time, but hopefully it is now! Do you remember when you used film in your camera and it had to be developed into prints? Did you ever pick up your photos and they were not your photos? Hey, don’t blame me, I just worked there. Read all about it at A Developing Genealogist. Weekend with Shades – Remember When? It’s that time again…time for my monthly Weekend with Shades column at Shades of the Departed, The Humor of It. This month’s topic – the Fotomat! If you don’t know what a Fotomat is, well, that means you’re younger than I am. Take a peek at how I try to describe it to my nieces in Fotomat – What’s That? While footnoteMaven is off to California for the Southern California Genealogy Jamboree, I’m blog-sitting today over at Shades of the Departed with my monthly “Weekend with Shades” column, The Humor of It. In keeping with the season, today’s article is “Vacation Lampoonery” with some tips on taking photographs that help you remember the humorous side of your summer vacations! 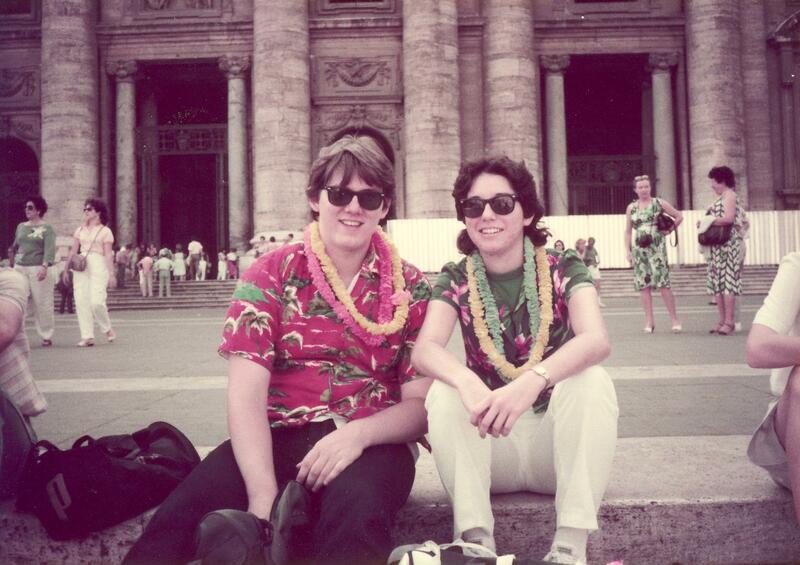 1985: Lou and Donna in front of St. Peter's, Rome, Italy. My first real vacation - with lots of lampoonery! It’s that time again…time for my monthly Weekend with Shades column, The Humor of It, at Shades of the Departed. After being sick this month, I had a hard time finding the humor in anything, but I found some inspiration in events that happen around this time of year – and seeing how silly my old photos of those events looked certainly helped! This month’s column is called Rites & Wrongs of Passage. It tries to find the humor in those two events that were oh-so-important long ago – the prom and graduation. Once again, I have a special photo (two for one this month) to invite you to join me at Weekend with Shades. 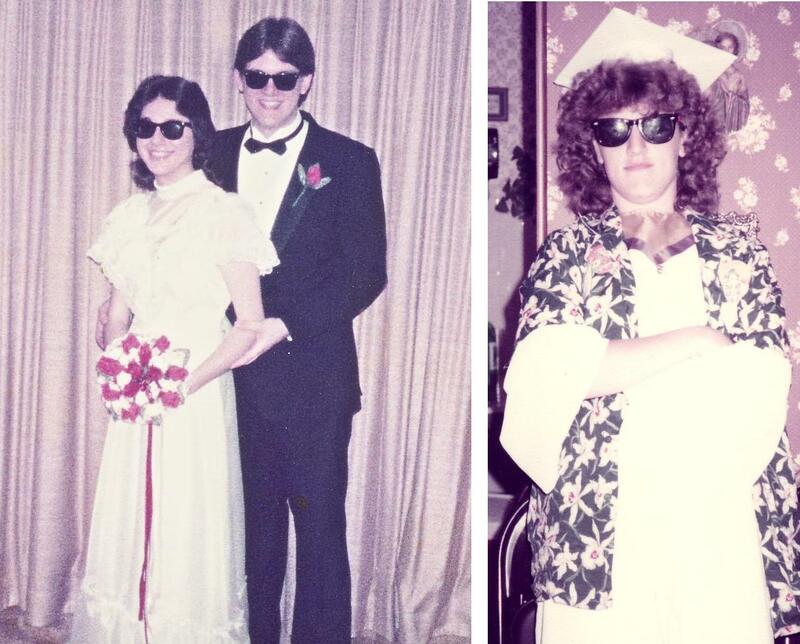 Lou and I at my senior prom; my friend Kathy as one seriously cool graduate. Yes, I know footnoteMaven doesn’t refer to these sorts of shades, but I can’t resist. Besides, I want to see how many shades photographs I can find – it’s my own personal photo carnival each month to entice you to wander over to Shades of the Departed for my column. Come to think of it, you should also wander over every weekend because there is a stellar collection of columnists, as well as during the week for the illustrious footnoteMaven’s own writing. In 1937, my dad also knew how to spend a weekend with "Shades"! When it comes to taking a group photo, there always seems to be one – one person who completely, unequivocally messes up the shot. Read the rest over at footnoteMaven’s place – I’ll see you there…I’m the one with my shades on. …at Shades of the Departed! My friend footnoteMaven apparently thinks I’m humorous, so I’m spending the weekend at her place. Please visit the debut of my monthly Weekend with Shades column, The Humor of It. This month’s post: Off With Their Heads! 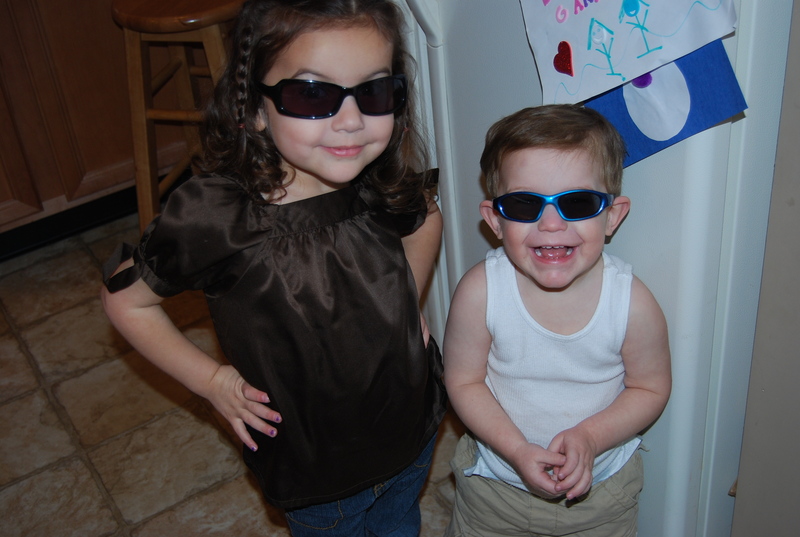 Ava and Nicky celebrate Aunt Donna's "Weekend with Shades" debut!